Okay, it’s really not that exciting. From my standpoint, it is…but in the grand scheme of things…definitely not novel, short story, or even periodical worthy. You see…September 19th marked my birthday. A milestone birthday…for a runner. I was moving up an age division. It fell on a Saturday this year, and for over a year, I had planned to run the Air Force Marathon to celebrate. Unfortunately, I fractured my ankle and couldn’t do it. As with everything running related this year. And I was really, really bummed. Like…having a meltdown the night before and just wanting to skip doing anything on Saturday because it wouldn’t be what I really wanted to do. My roommate had other plans. She and her family through in and gave me a $150 spending spree at Jungle Jim’s International Market…which is literally, Disney World for foodies…minus all the fun rides and characters. Which means, it is actually nothing like Disney World…unless you are there for the food! I mean, it is heaven for any foodie. And it’s a good thing I don’t live closer to Cincinnati, Ohio, or I’d be tempted to go there more often. That being said, I spent a good 2 hours perusing the aisles of the 20,000 square feet of Jungle Jim’s, searching high and low for gluten-free products I haven’t seen in my area. I’m still on the hunt for Rudi’s Gluten Free Texas Toast…which I have NOT been able to locate…and figured if anywhere would have it it would be Jungle Jim’s. So, while I didn’t find that particular goodie on my “must have” gluten-free indulgent food list…I did get a lot of good stuff. And, believe it or not, the very last item to go into my shopping cart was…the Chubby Bunny Bakery Jumbo Pumpkin Cookie with Caramel Icing. And, it almost didn’t make the cut. I was down to going between a fresh gluten-free granola, a gluten-free lemon bar, and the cookie. In the end, the cookie monster in me won out…and the cookie was what ended up in the cart, and then in the bag, and then…in my freezer (I had the most amazing gluten-free cookie cake made by my local bakery, Annie May’s Sweet Café, so this had to be kept fresh while I polished that off and then went out of town for my best friend from high school’s wedding). Last night, it emerged from the depths of my freezer and made it into my fridge to thaw out so that it could be my indulgent dessert tonight. Although, after stopping by Annie May’s for Soft Pretzel Wednesday™ and discovering her new Cookie Dough Cupcake…it was a near thing. I passed (amazingly enough) on the cupcake…this time. Dinner was easy tonight as I had everything prepped ahead of time and it just required a little bit of warming up before serving. This meant that my dinner (Vegan Pizza Chili…for the record) was actually made and consumed in a timely manner. And this also meant…dessert at a decent hour (although it is never too late or too early for a sweet treat, if you ask me!). So, while my roommate and I were devouring our chili, the cookies were out of the fridge and resting on the counter. And after dishes were cleaned up and put away…dessert time!! Chubby Bunny Bakery makes only gluten-free, dairy-free, and egg-free goodies. Some of their items do contain soy and/or nuts, but they can prepare any of their baked goods with a substitute ingredient upon request. This vegan bakery stocks the shelves of markets like Jungle Jim’s and the Oxford Farmer’s Market (through November), as well as the Moon Co-op in Oxford, Ohio. Chubby Bunny uses organic and non-GMO ingredients whenever possible and use no preservatives or ingredients that you can’t pronounce. Real ingredients yield a tastier, better, more indulgent treat. 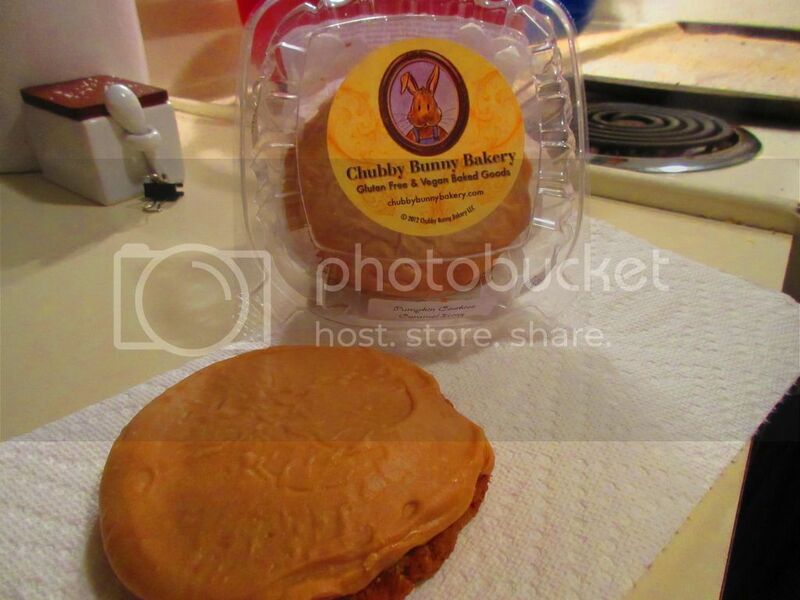 The Chubby Bunny Bakery Jumbo Pumpkin Cookies with Caramel Icing come two in a container. Now, if the cookies were smaller, I’d simply dish one up for me and one up for my roommate. But these are JUMBO cookies…and therefore, I can get 2 nights out of 2 cookies…simply by splitting the cookies in half. Which…means an extra night of tasty cookie goodness. Pumpkin was the first thing to catch my eye when I chose these, for the record, as I love, love, love pumpkin-flavored ANYTHING (except pumpkin pie, but that’s more of a texture thing). That was why these came home with me. Two words…that win me over every freakin’ time: Pumpkin and Caramel. HELLO!! So, I removed one (1) of the two (2) cookies from the clam shell container they came in and sliced it right in half. The knife glided through, which meant a couple of things: soft and moist. Winning already before the first bite. I loved the rather extravagant layer of the caramel icing that literally coated the entire cookie itself. Sort of like a miniature cookie cake. I’m all for this. I handed half to my roommate while I took a bite of the other half. HOLY FAT RABBIT, GLUTEN FREE AND VEGAN BATMAN! The Chubby Bunny Bakery Jumbo Pumpkin Cookies with Caramel Icing are crack in cookie form. The icing is sweet and loaded with delicious caramel flavoring. As I am not big on icing or frosting…this is a huge thing for me to notice. It didn’t overwhelm the cookie, just enhanced the already delicious cookie that was underneath. Because the star…the pumpkin cookie itself was fantastic. The cookie was soft and moist, not at all crumbly or dense. The pumpkin flavor was at the perfect level…not too much, but definitely noticeable. It hit every right note on my musical foodie tastebuds. I mean…WOW. There was absolutely nothing about this cookie that I didn’t like…except that I cut it in half to share instead of eating it all myself. HA!! Yes…if you can find them or order them…do not waste another moment and get yourself these cookies. It’s officially fall. Pumpkin is in. These cookies are pumpkin. Therefore, these cookies are what you need to be eating RIGHT NOW!! Let’s discuss ingredients, shall we? Chubby Bunny Bakery Jumbo Pumpkin Cookies with Caramel Icing are produced in a home, but per law, the ingredients that go into each chewy, moist cookie of pumpking yumminess are listed on the package. The pumpkin cookie portion of this treat is made from brown rice flour, potato starch, organic pumpkin puree, vegan margarine (palm fruit oil, canola oil, soybean oil, flax oil, olive oil, filtered water, pea protein, sunflower lecithin, lactic acid [non-dairy], naturally extracted annatto), ground organic flaxseed, baking soda, cinnamon, nutmeg, cloves, xanthan gum, sea salt and vanilla extract. The icing portion is made from vegan margarine (palm fruit oil, canola oil, soybean oil, flax oil, olive oil, filtered water, pea protein, sunflower lecithin, lactic acid [non-dairy], naturally extracted annatto), brown sugar, powdered sugar, organic rice milk, and vanilla extract. This bakery only offers gluten free and vegan treats. Indulge! While I can give you ingredients, as stated before, these are produced in a home, so there is no nutritional information to share. However, as stated before, these cookies are amazing…so ruin your diet for a day or two. And go check out the Facebook and Instagram pages for Chubby Bunny Bakery and see what other goodies they are baking up!! This entry was posted in Baked Goods, Cookies, Dessert, Food, Gluten-Free, Local, Products, Review, Snacks, Sweet Stuff, Travel, Vegan, Vegetarian by The Celiathlete. Bookmark the permalink.